New seam shaping. The Zephyr has a camber-like profile without using cams. 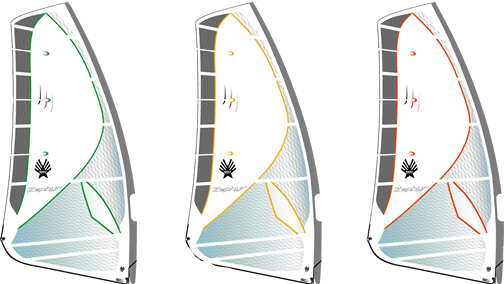 The Zephyr has a deep and draft forward foil which is what you want for light air sailing. 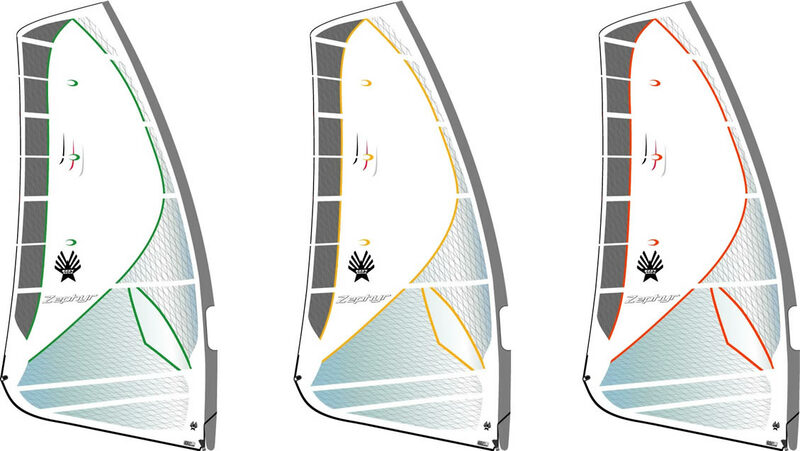 For stronger wind, apply more outhaul to flatten the profile, and the Zephyr becomes a perfect high wind Freeride sail. You’re not the first to rig it. Our quality is guaranteed because we rig every sail in our factory before it’s shipped. Every Ezzy Zephyr is rigged and fine tuned in our factory before shipping. The Zephyr is an amazing sail! I never thought I would see a camless sail perform like a cambered sail, especially in light wind. I will sail in medium wind next,and lastly strong wind." Rigging is staightforward and the indication marks on the sail for downhaul tension and outhaul distance are very useful. It's a pleasure to rig on a 460 mast. The boom is longer than I'm used to as this is a low aspectpowerful sail. I just had to adjust my tacks and gybes to keep the clue end clear of the water—no problem. I like the fullness of this sail, and even with that, the battens rotated very easily. The REAL JOY of this session, though, was how well I was able to plane in about 12 MPH! The water was not even capping, so I know it wasn't windy. It was one of those days that I used to talk myself into going out and then be bummed by lack of sailing fun. Not so with the Zephyr. It pulled like a little pony and had me laughing out loud. It gave me confidence to sail anywhere on the lake and know I could get back to my dock without slogging. A versatile and forgiving sail for cruising. I'll definitely put one of these on my summer wish list."